I have a lovely guest post from Hollie Marsh today talking about her series of books Sweetbriars. They are books I would have loved as a young girl as I was horse mad! Hi Hollie and thanks for joining me today. Can you talk us through the journey from idea to writing to publication? I wrote the manuscript for Sweetbriars almost fifteen years ago in Australia. My dream was to create a new Saddle Club series as I loved these types of books… books with fun, addictive characters that love horses, and evolve as the series progresses. A year and a half ago I had a baby and I hadn’t forgotten my book dream… so I dug out the manuscript and worked on it a few hours each day, whilst I was at home with my baby. My last professional job was not creative at all, so doing something creative was enjoyable and a welcome change. As I’d lived in England for almost ten years I changed the book to be set in the stunning countryside of Devon – where my Oldenburg foal was bred. The book is based on the many experiences I had whilst enjoying horse life in the UK – competing in dressage competitions, exploring bridleways and spectating at big horse shows. Also growing up riding ponies, going to Pony Club and having many fun adventures with my friends. What were you childhood/teenage favourite reads? I also adored more classics such as Flambards by K.M. Peyton and Chronicles of Narnia by C.S. Lewis. Getting lovely reviews. That is an incredible feeling, especially as a debut author. Setting up an equestrian centre at Sweetbriars is fun to Cate, but settling into a new school and having a stern Pony Club riding instructor that teaches dressage is less so. At school, Cate makes friends with Violet, who is confident and wacky, and through Pony Club she gets to know Tabby, who is sweet and popular, but hides a family secret. When the eccentric neighbour Sophia becomes a regular ‘drop in’ to the farm, Cate begins to learn about acceptance and what friendships really mean. The girls’ lives will be intertwined in ways they could never have imagined thanks to their shared passion for horses and Cate’s determination to make Sweetbriars a success. 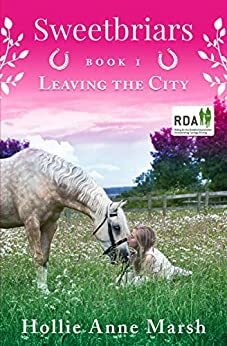 Sweetbriars is a proud supporter of The Riding for The Disabled (RDA) and for every book sold, a percentage of the book sale will be donated to this wonderful charity.